The City of Philadelphia Government, with a goal of 100-percent clean energy use by 2030, will need to utilize solar, wind and energy storage technology to go completely clean, officials say. A solar array large enough to power 22 percent of the entire City of Philadelphia’s governmental electricity needs is in the works, and received the go-ahead from Mayor Jim Kenney on Tuesday. The deal is one of the biggest between an American city and a clean-energy provider, officials said. The solar panels will be built on open space in Adams County in south central Pennsylvania. The city is signing a 20-year power purchase agreement with a Radnor-based company called Community Energy Solar. The project will easily be the largest solar array in the state. “It’ll be seven times as large,” Community Energy Solar CEO Brent Alderfer said. The 70-megawatt array will be built on roughly 700 acres. It’s the first step in what city officials hope will become 100-percent energy reliance on clean power sources by 2030. Alderfer said cities like Philadelphia that want to go totally clean will need to incorporate a combination of solar and wind power technologies with fuel storage, a sector that is still undergoing rapid development. “There are not many cities who have stepped into the major leagues on climate change. Philadelphia is now on the lead on that,” he said. Alderfer, a native of Montgomery County who spent 18 years in Colorado, including a stint on that state’s energy commission, co-founded the clean energy company in 1999. He said the company began working in wind energy, but entered the solar sector in recent years. – The 70-megawatt solar array will be built in Straban Township, right outside historic Gettysburg. 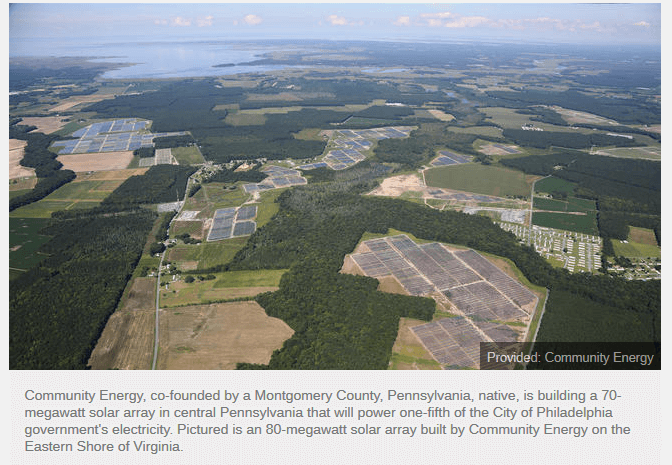 It will dwarf the next largest solar array in Pennsylvania, which is 12 megawatts. – The City of Philadelphia will enter into an agreement through the Philadelphia Energy Authority, which will purchase enough electricity to make up 22 percent of the city’s annual needs. – The deal is officially with Adams Solar LLC, which will be a subsidiary of Community Energy Solar. The city will enter into a fixed rate, which all sides are hailing as a way to save money over the course of a 20-year agreement as more traditional energy providers are expected to see prices rise in the decades ahead. – Adams Solar has promised to meet all city diversity hiring requirements. In light of concerns by some city lawmakers that it would be difficult to meet those standards using only Adams County residents, the company and city officials have said workers would come in part from outside the county, which is about 100 miles west of Philadelphia.